Every year millions of people flock to Las Vegas. Whether it be for the opportunity to strike it rich, the lively nightlife, or just the over-the-top fabulousness, Las Vegas is all about the experience. Personally, I love a Vegas trip for the ultimate shopping and dining adventure. Nowhere else I’ve been has so many luxury retailers all in one place like The Shops at Crystals. 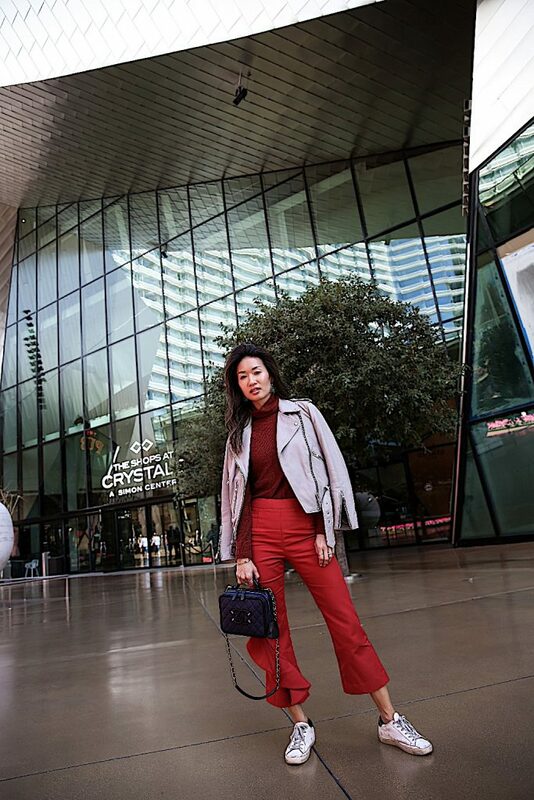 From the stunning, modern architecture, to the convenient location in the City Center complex at the heart of Las Vegas Boulevard, The Shops at Crystals is the premier shopping destination for those seeking luxury, exclusivity, and opulence. The 324,000 square foot mall boasts more than 40 extravagant boutiques including Louis Vuitton, Gucci, Tom Ford, Celine, Saint Laurent, and Harry Winston. Many of the stores have exclusive opportunities for customers such as the James Turrell light and space exhibition inside the flagship Louis Vuitton store or the private entrance to a crocodile and chinchilla lined VIP fitting room at Prada (where they also carry runway collection pieces not available in other Prada stores). There’s a reason why celebrities love strolling the floors at The Shops at Crystals! Entering The Shops at Crystals you are blinded by the gorgeous natural light that fills the the contemporary, jagged, and haphazard ceiling. From the colorful, living flower carpet, to the modern water features, to the lighted mosaic stairs, and the magnificent “Tree House” fixture, there is no limit to photo opportunities here! 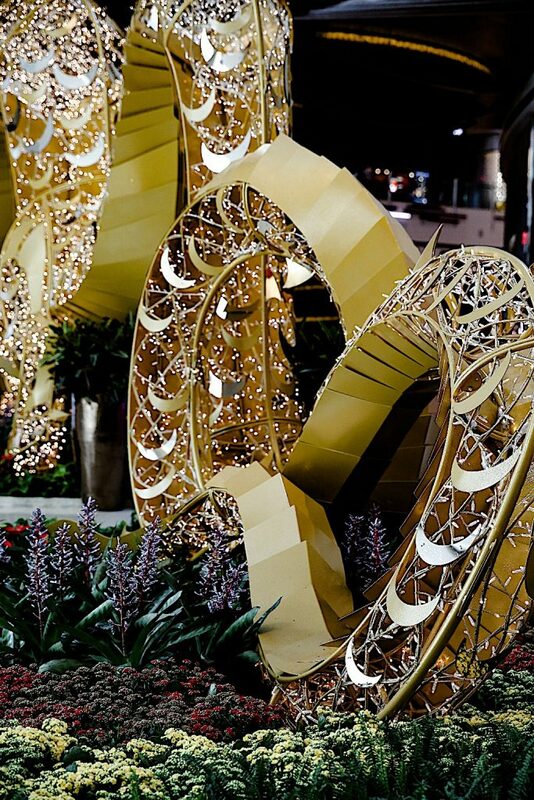 And just in time for the Lunar Year Celebration which begins on February 16th, The Shops at Crystals is home to a 24 foot tall and 53 feet long Golden Dragon which weighs more than 3,000 pounds and is lit by more than 100,000 LED lights! Grandiose and majestic are definite understatements to describe this ornate, custom-made Golden Dragon by George Oehler, Peter Remake and Sylvia Quan. 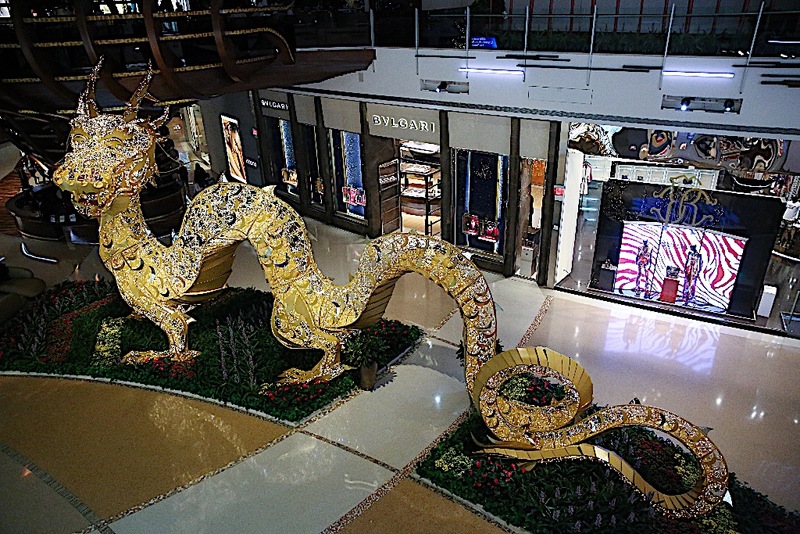 Finished with Italian custom-made golden paint and shipped to the U.S. in one piece (yes, ONE PIECE), this Golden Dragon is a must-see for Chinese New Year. If you’re looking for more flare for the Lunar Year celebration, the annual grand Lion Dance performed by World Dance Champions, Yau Kung Moon will take place on Saturday, February 17 from 12pm – 1:30pm. 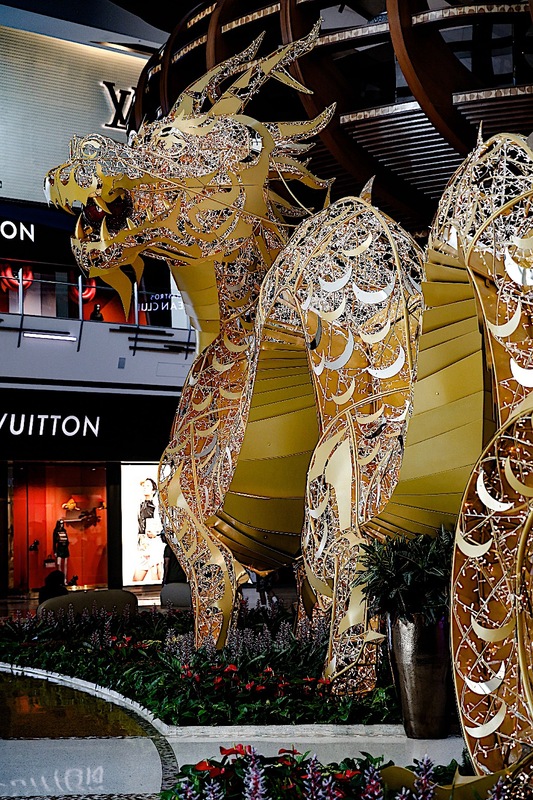 For those of you who haven’t seen it before, the Lion will parade through the center while luxury retailers “feed” the lions ensuring good luck, health and fortune in the coming year. While the Golden Dragon is the focal point of the Lunar Year decor, classy and minimal red lanterns also hang from the elevated ceilings and a display of Chinese red envelopes called hongbaos dangle from trees near the mosaic steps. If you want to take a break from shopping and oogling at all the lavish details at The Shops at Crystals, Sisley, a luxury French skincare brand, offers radiance-enhancing and anti-aging treatments in a spa cabine area which is pure relaxation. I literally felt my skin plump up after this facial and thoroughly enjoyed the aromatherapy aspect to this hydrating experience. After the facial I didn’t even have to worry about not having any makeup on as the store carries it’s own makeup line and I was treated to an entire makeup session (I even learned a few new makeup tips too). Relaxed and primped to continue my day, I headed to Stella McCartney to see their Spring 2018 collection and the IT bag. 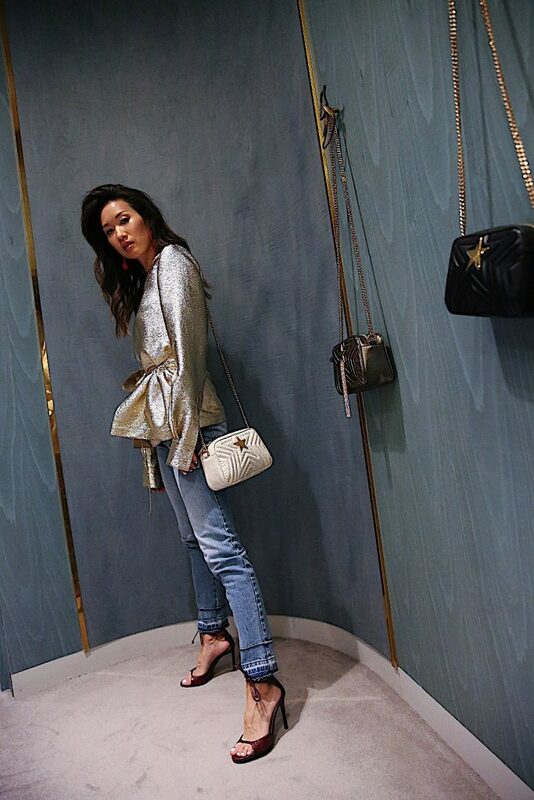 The first thing that caught my eye when I walked into Stella McCartney was the dazzling horse chandelier called “Lucky Spot” adorned with 7,000 Swarovski crystals. Shimmering and glowing, it truly is a fanciful piece! From everything to women’s clothing, accessories, men’s and kid’s ready-to-wear, to making all pieces sustainable, this brand has it all. I quickly fell in love with this dazzling, gold, lurex blouse with ruffle detail from the Spring collection. 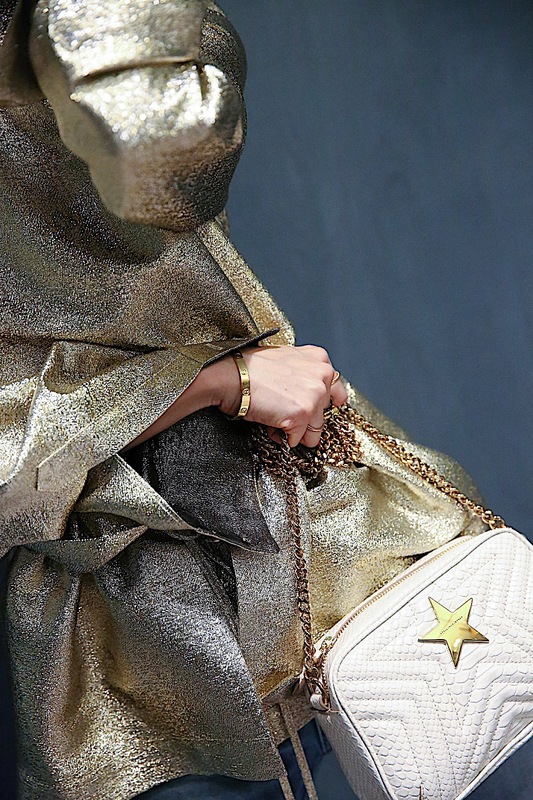 I definitely had to have the newest Stella Star mini bag with iconic star design and hardware to go with this blouse. Both pieces are so hot for spring and the camera style bag with chain handle is the perfect bag to grab on the go. Shopping is definitely considered a form of cardio for many and walking around this massive mall you definitely work up an appetite. To get some fresh air I took a peek outside and crossed the “pocket park” between Crystals and Aria hotel. At Aria, I went straight to Herringbone for their California-inspired coastal cuisine. My favorites include the whole fish ceviche and the ahi tuna poke and macadamia nuts which comes with nori chips! Full from an incredible lunch, I had to walk it off with more shopping of course! Next up was DSquared2 an Italy-based brand created by two brothers from Canada. Their collections are produced in Italy, but also give rise to the brand’s motto of “Born in Canada, Living in London, Made in Italy.” All those elements create pieces that are a mix of contrasts melding between sporty and glamorous, masculine and feminine, and casual and extravagant. The store supervisor Crystal and manager Michael were incredibly helpful in quickly identifying my style and selecting pieces that literally spoke to me. Denim and leather combinations and vibrant streetwear looks that are edgy yet comfortable to wear all day is what I am all about. A quick trip to the flagship Dolce & Gabbana is also a must while at The Shops at Crystals. The store encompasses facets of the iconic Las Vegas Roulette with bright lights on a video wall and a magnificent baroque style black chandelier. A visit to their vanity room, a burgundy damask room with sultry mirrors on all sides is worth going to see. And just for the Lunar Year, grab one of their unconventional Year of the Dog t-shirts embellished with logos, ribbons, crystals before they sell out. Just walking from store to store here at The Shops at Crystals is so exhilarating! You literally see it all from every brand, every display. 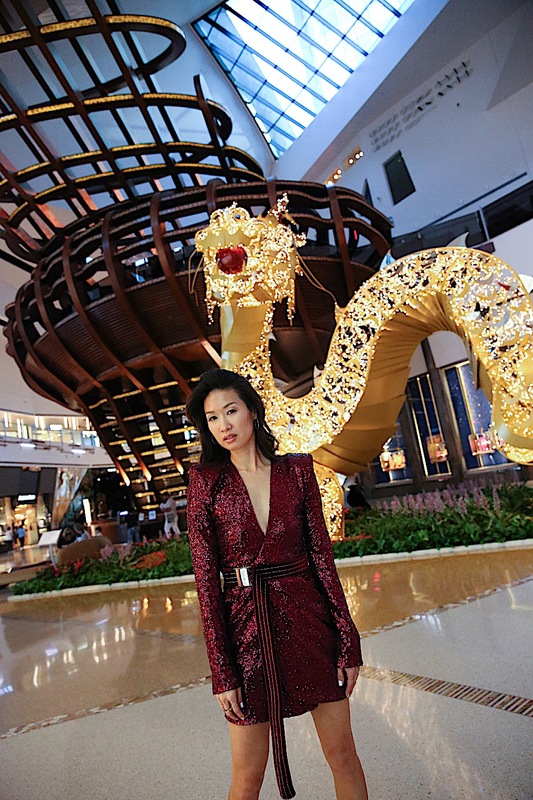 It is THE place to shop in Las Vegas because it is home to the best luxury stores in the world and also to the most exclusive boutiques not available anywhere else in Las Vegas. And the only way to end a successful day of shopping is to dine in the 80 foot tall sculpture Tree House above The Shops at Crystals feasting on amazing pretzel bread, filet mignon and the infamous butter cake at Maestro’s Ocean Club. The Shops at Crystals is a must-see for any Las Vegas visitor to truly encounter the luxury, fashion, and exclusive experience of Vegas. See below for further information. Thank you to The Shops at Crystals for sponsoring this post and for being my ultimate luxury shopping destination in Las Vegas. Omg Christine, this place looks amazing! I have been to Vegas SO many times and stayed at so many different hotels and I’ve never even stepped foot in this gorgeous mall!! Next time I’m in town, that’s where I’m going in search of my next pair of heels and bag. Love the post and all the beautiful pictures! That dragon is everything. Happy lunar new year! Can’t wait to shop there one day soon!! I love these outfits especially the second one and the place looks great too. I was blown away by your post! Such an amazing experience at The Shops at Crystals. The dragon is spectacular. I don’t have any Vegas trips planned this year but I might have to squeeze one in. 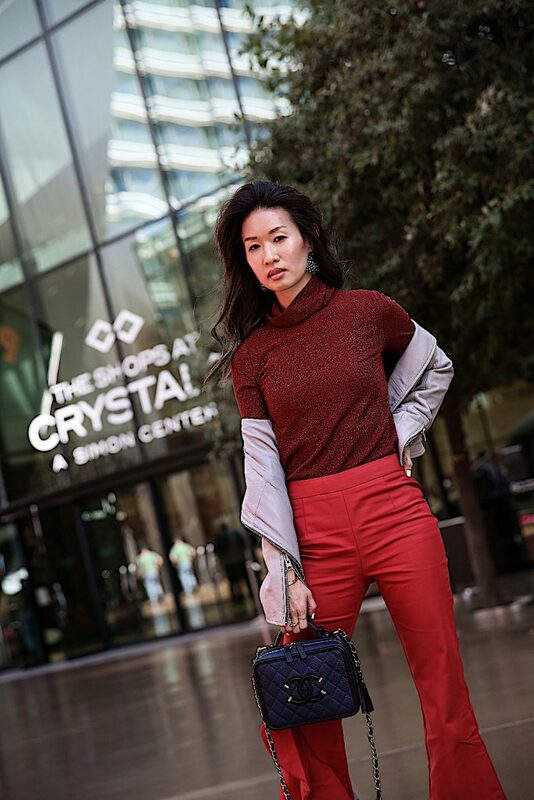 I am loving all your outfits and I can totally relate to this post obviously because I celebrate Chinese New Year and I was in Vegas this past weekend! Again I am so upset that we missed each other because I had no idea you were even there but I’m so glad you enjoyed your experience and I absolutely love all your outfits! These outfits are so cute!! I love them. Love your outfits babe, the glittery dress look so stunning on you!!! Its been a long time since I have been to Vegas but last time I was there I don’t think this Crystal existed. However I think I should plan a new trip to get to experience this. The gold top look is hands down my favourite but i love that red sequin dress on you too! Just stunning! OMG this is seriously THE ultimate luxury shopping experience! ! I haven’t been to Vegas in forever and the last time I was there, we didn’t get to do any shopping at all and seeing/reading this post makes me want to fly to Vegas and get my shopping on at Crystals asap. I love that it has all of the big luxury brands are all there as well as the more edgy, young fashion cult favorites. All of the outfits you wore looked so stylish and amazing, the DSquared parka looked edgy and chic with a belt and that shimmery gold metallic Stella McCartney top is so luxe. ADORE!! Such a fabulous 12 hours well spent and you need to be my shopping buddy. This is one of my favorite places to shop too! <3 🙂 Looking super chic as always, Christine! One of my favourite places to shop. Your ensembles are all fabulous and you look stunning in them! I can really feel the Chinese New Year vibe. It is truly a nice festive to catch. I love your first look. I haven’t been to Vegas in a while but need to go now so I can check out these shops! I too love Vegas for the shopping and dining experience. I’ve never been to this mall before – it looks fabulous. All your photos and outfits look amazing! Thanks for sharing! You sound like you’ve had the most luxurious shopping experience at The Shop At Crystals shopping centre! All those prestigious brand names, the stellar customer service, and all that lunar new year decor! You look stunning in all those looks Christine! The Stella outfit is my favourite, that golden top is so fab and love you paired it with jeans and those pretty heels. How are you? So in love with this! I couldn’t agree more, Las Vegas is wonderful. I love the experience and shopping opportunities. These images are honestly so stunning. That burgundy and sparkly dress is everything. So gorgeous and you look so good wearing it. Those shoes are also so so cute. Thanks for sharing I really loved it! I always come here when I visit Vegas!! The shops are amazimggg and I love the atmosphere! Love all the pieces you picked up 🙂 The Stella bag is too cute!! I’ve always wanted to visit this magical place and understand why people get crazy about it. Apart from the stunning architecture, I bet Las Vegas has a lot to offer. Amazing boutiques, all the brand shops – must be so fascinating! No wonder that one can easily fall in love with the city. Btw, the red glitter dress is absolutely gorgeous and perfect for the city like Vegas! So edgy and fabulous! My fave would be the glittering red dress, you look so glam on it dear! Such a great combination of red and pink colors in your 1st outfit. Actually, I love all of your picks and happy that you spent your day great. Crystals seem to be a perfect place to do shopping in. I will go there when I’m in Vegas. Shopping at Crystal or just take a round can be very exciting. Thank you to talk about this excellent center . You outfits are gorgeous. I can’t choose from both red dresses or love the leather parka wow sonedgy w the belt . Looking you enjoyed a lot with a final lunch . I’ve only been to Vegas once and the time I did go, I had 0 time to shop. The Shops at Crystals looks like a place I need to visit the next time I’m there. I am a huge fan of luxurious architecture and overall experience. Your looks were on point there too girl! You look so gorgeous in all of these shots! The Shops at Crystals sounds amazing for luxury shopping! The space itself looks breathtaking. Love that they celebrated the Lunar Year with such stunning decorations! What a great experience! It sounds amazing to visit there just in time for the lunar new year. The shops at Crystals sounds like such a luxe place! OMG Vegas looks soooo so good on you love! !